Colonel Evanov and SG-4 return to the SGC with Alebran, an alien who claims that Nirrti has been using a device to experiment on his people. 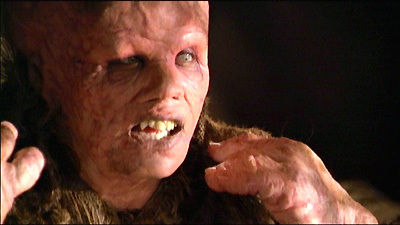 SG-1 fears that Nirrti has continued her genetic experiments to alter DNA in an attempt to create a hok'tar, an advanced human host, and their fears are realized when Alebran's body suddenly dissolves into liquid. SG-1 and SG-4 return to the planet and enter Nirrti's fortress. There they find that Nirrti's treatments have left the inhabitants profoundly disfigured, but also with formidable side effects. Eggar has developed psychic abilities, and Wodan has remarkable telekinetic powers. Nirrti's DNA device may have been built by the Ancients, and SG-1 must capture her alive in order to force her to reverse the effects of her experimentation. However, the inhabitants are convinced that Nirrti is a god who is helping to heal them, and when Eggar reads O'Neill's mind and fears he has come to kill their god, the inhabitants turn against the team and imprison them in the dungeon. Nirrti returns and continues her experiments, first taking Colonel Evanov. He eventually dissolves in the same horrible death as Alebran, and Carter is taken as the next victim for Nirrti's machine. Nirrti subjects Jonas to the DNA device, however, she discovers that his genetic structure is already highly advanced, and she tries instead to seduce him with promises of power. Nirrti turns next to O'Neill, who makes one final attempt to convince Eggar to look into Nirrti's mind. In doing so, Eggar realizes the truth behind Nirrti's experiments. Wodan uses his telekinetic abilities to snap Nirrti's neck, killing her. However, Eggar had also been able to retrieve from Nirrti's mind the knowledge necessary to reverse the effects of the DNA device, and he is able to safely heal Carter and the rest of his people. Nirrti is using the DNA resequencer to directly alter human DNA in real time, as part of her experiments in genetic manipulation to create a hok稚ar, or advanced human. Effects include telepathic and telekinetic abilities. The original device may have been of Ancient design. Jonas痴 ancestors of Kelowna were taken from Earth by the Goa置ld thousands of years ago as slaves. In those thousands of years on Kelowna, genetic evolution resulted in advanced abilities. Lieutenant Colonel Sergei Evanov was the commanding officer of SG-4, the Russian SG team. So, if any of you can bend steel with your bare hands, or happen to be more powerful than a locomotive, just raise your hand. Hail Dorothy! The wicked witch is dead.